Czech automaker Škoda Auto a.s. is debuting its newest car, Škoda Scala, in Israel. Škoda CEO Bernhard Maier will unveil the new compact family car Thursday evening at an event outside Tel Aviv. This is the first time a global automaker has globally debuted a car in Israel. The Škoda Scala will be built on the MQB A0 platform and is designed to be a bit longer and wider than its predecessor, Škoda Rapid. The new model will feature a constant internet connection and a new infotainment system, according to the company website. Earlier this week, Škoda announced collaborations with three Israel-based auto tech startups, Chakratec Ltd., Anagog Ltd., and UVeye Ltd. The company has been expanding its Israeli footprint since establishing a local technology scouting office in Tel Aviv in August 2017. Dubbed Škoda Auto DigiLab, it is operated in partnership with Skoda's Israeli importer Champion Motors Ltd.
Anagog develops artificial intelligence technology that can track drivers and predict their needs based on data from their mobile phones. Chakratec develops a kinetic battery device, which stores energy using a flywheel instead of relying on chemical compounds like in lithium-ion batteries. UVeye develops machine learning and computer vision technology for automatic external inspection of vehicles. Škoda has also announced this year collaborations with Israeli auto data monetization startup Otonomo Technologies Ltd., cybersecurity startup XM Cyber, and car sensor startup Guardian Optical Technologies Ltd. 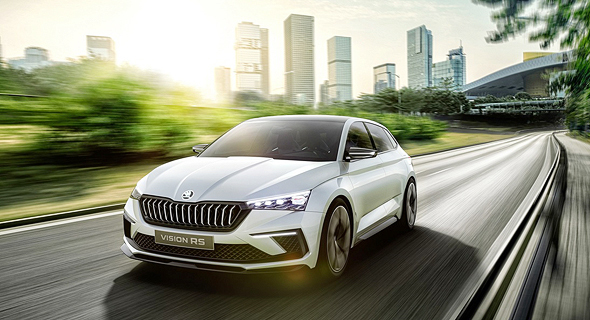 According to Škoda, 300 correspondents from 22 countries are set to attend Thursday's unveiling, as well as 100 Škoda personnel and distributors.